Anne Aylor: Write Now! : The birth of flash fiction? The birth of flash fiction? We tend to think of flash fiction as something relatively new, but it's my guess that one of its first appearances in print was in 1924 in Paris in a little book by the then unknown Ernest Hemingway. This slim volume on homemade paper was published by Three Mountains Press and edited by Ezra Pound. Three Mountains was a small press set up in Paris the Twenties that showcased, in limited editions, hot and upcoming authors of the time. They included famous names such as Pound, James Joyce and newcomers to the literary scene, including the unpublished Hemingway. 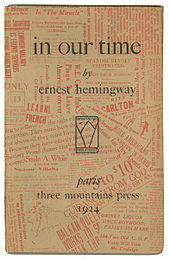 in our time was only 32 pages and contained some of Hemingway's first short stories, among them "Indian Camp", "The End of Something" and "Big Two-Hearted River". Interspersed between the stories were inter-chapter vignettes. These 15 numbered vignettes were untitled, some of them only a paragraph long. They have three main themes: war, bullfighting and crime, all themes that Hemingway returned to again and again throughout his career. Maera lay still his head on his arms, his face in the sand. He felt warm and sticky from the bleeding. Each time he felt the horn coming. Some times the bull only bumped him with his head. Once the horn went all the way through him and he felt it go into the sand. Some one had the bull by the tail. They were swearing at him and flopping the cape in his face. Then the bull was gone. Some men picked Maera up and started to run with him toward the barriers through the gate out the passageway around under the grandstand to the infirmary. They laid Maera down on a cot and one of the men went out for the doctor. The others stood around. The doctor came running from the corral stop where he had been sewing up picador horses. He had to stop and wash his hands. There was a great shouting going on in the grandstand overhead. Maera felt everything getting larger and larger and then smaller and smaller. Then it go larger and larger and larger and then smaller and smaller. Then everything commenced to run faster and faster as when they speed up a cinematograph film. Then he was dead. Hemingway described the stories and vignettes in a letter to Pound before their publication: "When they are read together, they all hook up . . . The bulls start, then reappear, then finish off. The war starts clear and noble just like it did . . . gets close and blurred and finished with the feller who goes home and gets clap." One of the preminent critics of the day, Edmund Wilson said of in our time that the writing was "of the first distinction" and that the young writer from Oak Park, Illinois had "almost invented a form of his own". Yes, I'd say. Flash fiction. PS: The Bridport Prize is one of the largest, most prestigious creative writing competitions and has an annual competition for the best short story, poem and flash fiction. I was lucky enough to have been shortlisted a few years ago for my story "The Speed of Dark". The 2013 date for submissions has passed, but there is always next year. The prize for flash fiction is £1000, much more than Hemingway would have received for in our time.